Home Camille McConnell Stop Overeating Today! Stop Overeating Today! is a must-have tool with 33 strategies that teach overeating sufferers how to transform their thinking and emotions around food so overeating urges and binging disappear. Over 50 workbook pages enable the tips to be utilized and applied immediately, making it an active, personalized tool instead of just another book to collect dust on the shelf. Written by a life coach with eating disorder recovery mentoring experience, Stop Overeating Today! is intuitive and empathetic. In fact, the author used these proven tips to fight and conquer her own addiction to overeating. Stop Overeating Today! is so condensed, concise, and powerful that reading for only two minutes each day will deliver meaningful results. Make this book your resource to achieve a life of healthy balance and never look back on those days when self-mastery was just a dream. 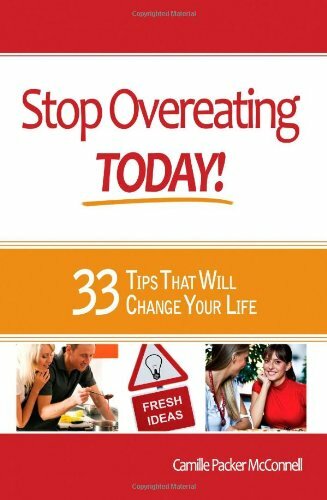 For readers who desire additional support to stop overeating, thirty minutes of free life coaching is provided by the author.